Google Jamboard is an awesome digital Interactive whiteboard developed by Google, Another family partner of the G Suite family. Jamboard compatibility for online business collaborations, Designed for use in conference rooms and with mobile devices. available with the G Suite Enterprise or Business or Basic edition as well as G Suite for Education or G Suite Enterprise for Education. It has a 55″ 4K touchscreen display, also it can be mounted onto a wall or be configured into a stand. 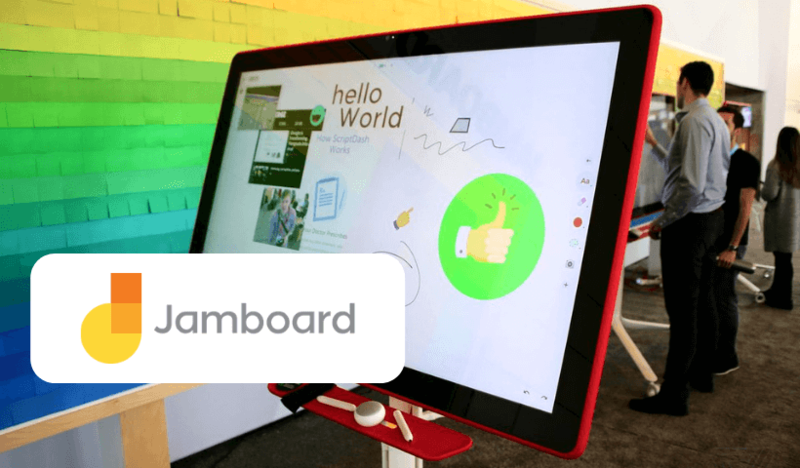 Jamboard has a number of Google technologies that facilitate interaction in real time through the internet. Including Google search features, shape and handwriting recognition, AI technology for auto drawing, and automatic layouts. That’s mean you can do more with Google products by using this awesome Jamboard. How to setup Google’s Jamboard? Here are some related links provided by Google Support. You can use these links for your needs. What are the features in Jamboard? Google Jamboard also has two white stylus pens for drawing and another device like an eraser. The rolling stand is an additional accessory for Jamboard. It runs a variant of Android Marshmallow. You can use the tablet app and the board to create and edit jam files. But some features are limited with the phone app. The phone app has a drawing and moving editing features, You can easily control elements. Also, you can use the tablet app or phone app to add documents from Google Drive to Jamboard. The Web App available only for viewing. Jamboard app also available on both Android and iOS. How to use Jamboard Apps? Google said Jamboard costs $4,999 without a stand. You can check the current price from Google’s Product page.